Discussions4Learning was the subject of a scientifically-based research study conducted by Clark University of Worcester, Massachusetts. The study included three public kindergarten classrooms. All of the students in the study qualified for free lunch, and over 80 percent of the students were from homes where a language other than English was spoken. Two experimental classrooms used Discussions4Learning: Experimental 1 (shown in blue) and Experimental 2 (shown in green). The control classroom (shown in red) did not use Discussions4Learning. All students in the three kindergarten classrooms were given a set of pre- and post-tests. 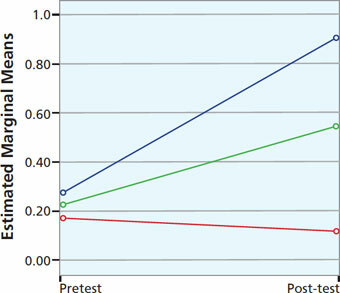 Students in the control group made no such gains. 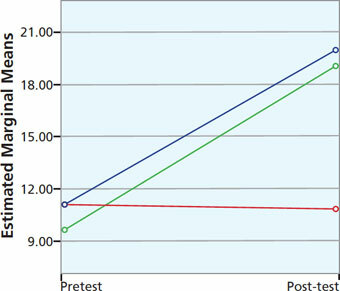 While all students—those in the two experimental classrooms that used the Discussions4Learning curriculum and those in the control classroom that did not use the Discussions4Learning curriculum—scored similarly on vocabulary knowledge and comprehension in pre-testing, post-testing demonstrated significant, statistical gains made by the two classrooms using the Discussions4Learning curriculum. This included both the classroom with the first year teacher and the classroom with the more experienced classroom teacher. 1. Overall vocabulary knowledge. All students scored similarly in pre-testing. However, the students in the two experimental classrooms that used the Discussions4Learning curriculum scored higher on overall vocabulary knowledge, as measured by the Peabody Picture Vocabulary test, than those students in the control group that did not use the curriculum. This was especially significant because it demonstrated that the vocabulary gains went beyond those vocabulary words that were specifically targeted in the Discussions4Learning lessons. 2. Retention of target vocabulary. Post-testing demonstrated that students who participated in the Discussions4Learning curriculum were able to remember the meanings of the high-level, academic vocabulary that had been taught in the Discussions4Learning curriculum in the previous months and weeks. 3. Using context clues to figure out the meaning of new words. 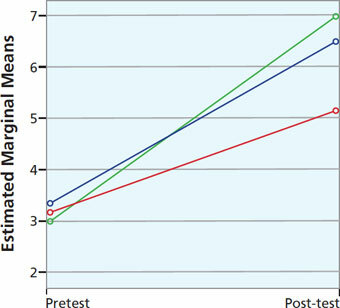 While all students scored similarly in pre-testing, the students in the two experimental classrooms that used the Discussions4Learning curriculum scored higher on figuring out the meaning of challenging and unfamiliar words in expository paragraphs than those students in the control group that did not use the curriculum. 4. Comprehension. 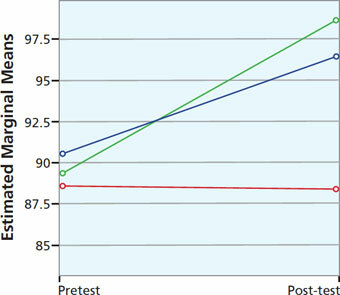 While all students scored similarly in pre-testing, the students in the two experimental classrooms that used the Discussions4Learning curriculum scored higher on measures of comprehension of both fiction and nonfiction passages than those students in the control group that did not use the curriculum.